North Carolina legistators are fighting over a church and state issue. North Carolina getting a state religion? No. 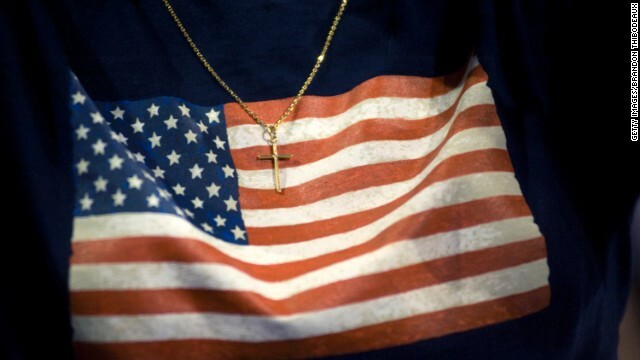 (CNN)– Politicians often declare that the U.S. is a Christian nation, but a group of representatives in North Carolina wants to add a new wrinkle to that argument. They want North Carolina to be able to make its own laws establishing religion. Two Republican representatives in North Carolina filed a resolution Monday that would permit the state to declare Christianity its official religion and reject any federal laws or court rulings regarding how the state addresses the establishment of religion. Critics say the resolution violates the U.S. Constitution’s First Amendment guarantee that government will not prefer one religion over another. But a supporter of the resolution said it is about protecting another freedom. The resolution reads in part, "The North Carolina General Assembly does not recognize Federal court rulings which prevent the state, its public schools, or any political subdivisions in the state from making laws respecting the establishment of religion." Rep. Carl Ford, the resolution’s co-sponsor, told the Salisbury Post the resolution's intent is to support county commissioners in Rowan, North Carolina, who routinely end their invocations at public meetings with "In Jesus' name, amen." A Rowan County resident filed a lawsuit against the county in March saying that she was not a Christian and that evoking Jesus in a public meeting sends the message that county commissioners favor Christians. “We’re not starting a church. We’re not starting a religion. We’re supporting the county commissioners in their freedom of speech,” Ford told the Post. Ford did not respond to interview requests. By Thursday afternoon, the resolution was dead. Jordan Shaw, a spokesman for North Carolina House Speaker Thom Tillis, said, "the bill that is getting so much attention is not going to move. It's dead." Shaw said it would probably be referred to committee but would not come before the legislative body for a vote. When asked why it was not moving forward, Shaw said the legislation did not accomplish what the legislators who had submitted the resolution had hoped for it. David Graham, an associate editor for The Atlantic Monthly, said the North Carolina resolution signals the revival of the states' rights “nullification” theory: a legal argument invoked as far back as the 19th century that claims states have the right to void, or nullify, federal laws they oppose. During President Obama’s presidency, conservatives have claimed that states could ignore duly passed federal laws dealing with health care and gun control, Graham wrote in a blog post for The Atlantic. Courts don’t buy the nullification theory, Graham said. The nullification theory won’t die, though, because it serves a purpose, Graham said. Hey there! I know this is kinda off topic but I'd figured I'd ask. Would you be interested in trading links or maybe guest writing a blog article or vice-versa? My blog discusses a lot of the same subjects as yours and I feel we could greatly benefit from each other. If you are interested feel free to shoot me an email. I look forward to hearing from you! Superb blog by the way! Politicians............................... BETTER KNOW THIS !!! Does the RCC have any ? .............politicians too ? No, states can't create "State Religion". But if the religious fanatical right want to see an example of that, they can look at Saudia Arabia and the other fundamentalist religious dictatorships. Looks good to you sadistic dimwits, right? No, this is just the republicans acting like fools again. A wonderful day today. I would like to thank the God of Abraham, Isaac and Jacob for all he's done for us, even if not everyone is thanking him, please accept my thanks. And thank you for sending Jesus to die and raise again for our sins. You're the best. Ever. Message not deliverable. Ent'ity unlocatable. God has no trouble being there. He's the most fantastic being, supreme, almighty, there aren't words sufficient to describe him. I'm in awe of my lack of ability to adequately describe him. It's a mental overload to try. Thank your big guy in the sky for my cancer for me, will ya. What a champ. I mean chump. Wouldn't that suggest getting to know God sooner? dustball, Do you have any evidence of a god? is in the bible. But it is a secret. The key is to believe God first, then read it. How can you believe in something before you try to prove it either exists or does not? That would be like saying you have to say a person is guilty in court before reviewing the evidence. Apply logic... If your pitch is "you got to beleive before you read our book", you need to rethink your sales plan. You won't meet your quota if not. No that's faith. Where's the evidence? Yes that (your reliance on faith) is the truth. Where's the evidence? Do you have that much faith when you purchase property? If so I have some beach property in Utah to sell. Very reasonable. How can you be for Jesus if you do not believe the bible is the truth? Jesus' message has very good principles when you take away the hoo doo. If "christians" stuck to his true message, we would not have as much hate in this world. There would be understanding, less @$$ backwards laws, etc. Read your "evidence" with an open mind. You might actually learn something valuable. Like the bible it is misleading in order to control the gullible. I say that I believe God, because I enjoy it. It is happiness and joy to me. You fell into my trap. The Establishment clause of the 1st Amendment to the Constitution has been under attack since it was first adopted. Thanks to its brilliant designers, it has stood the test of time and continues to do so. In order to afford every citizen the right to believe in whatever they so choose, the key framers of the U.S. government knew they had to keep religion away from government as much as possible. This was not some new idea that just popped into their heads. People were fighting over religious differences in framers' home states – Madison's advocacy for separation of church and state began long before he was charged with drafting the Constitution and the Bill of Rights. The Civil Govt, tho' bereft of everything like an associated hierarchy, possesses the requisite stability and performs its functions with complete success, Whilst the number, the industry, and the morality of the Priesthood, & the devotion of the people have been manifestly increased by the total separation of the Church from the State. They were fat people too? His panic They are working on the gut ..................................no god(s) required for this part of the state ? Apr. 4, 2013 — For the first time, researchers at the University of North Carolina at Chapel Hill have isolated adult stem cells from human intestinal tissue. His Panic ........................soon.........................ethics will beat it up maybe ? Did you finally sober up and figure out that ministers can indeed reach out to their parishioners and suggest they get therapy, loopy? Let us mind a little what a state actually is. Imagine an completely empty earth without human beings. Suddenly ten naked men would emerge, and would ask themselves how they could survive because they had no food, no cloths, no houses, no transport means, nothing at all. First, they would agree to make some cloths, built some cottages, and to collect some fruits, for the sake of their needs because nobody can endure the cold of the night without clothes and shelter, and nobody can endure hunger and thirst for a longer time. After a while of extremly hard struggle the ten men would realize that everybody of them had special gifts, and thus various professions would emerge: carpenter, bricklayer, taylor, farmer, bootmaker, cleaner, baker, butcher, hunter, etc.. They would supply eachother with the products and sevices which they would daily need. Nearly everthing would be okay as long as there would be a balance of give and take. However, it could happen that after a while Charly, the butcher, becomes lazy, and tells the other nine the following: "John give me my bread today, I will give you some sausages next week"; "Freddy repair my shoes today, I will give you some sausages next week"; etc.. Charly runs up debts, and the others will even tolerate that as long as Charly delivers his sausages at the promised time. Yet, when Charly would delay his deliveries further more the other nine men would gather, and discuss what to do with Charly, who has become lazy. This is what we call debt crisis. Another problem could emerge, when one of them would become greedy, and disturb the balance by that. For instance, Johnny would decide to make bread and sausages. This would mean that less of Charly's sausages would be needed, and he would get less of the other produced goods; worst case he could "sell" no more sausages, and hence would be excluded from the little economy. This is what we call economical concentration. Or one of them could simply become a thief who presumes to take the things of the others without any counterperformance; also this would cause a quick council of the 9 other men. Thousands of issues are imagineabel which could disturb our little society. Therefore they may elcect a major or a governer who is concerned about such issues. Sometimes they would gather on a council in order to make laws according to which the maior has to judge the wrongdoers. It could even happen that through pefect law and action of the governer the little state would work, and there would be a balance. Everybody would produce goods according to his capablilities, and everybody could consume accoring to the measure of his performance. Yet, in the evening, after work, nobody would see any reason to visit his neighbour. After a day of exchanging goods and services people go home being no more interested in each other, maybe being even sad that they culd not gain more proft on cost of their neighbours because of the law and the governer. This shows us that the state is only an emergency facility but not the perfect state of mankind. People need something which makes them loving each other and having community independent from exchanging goods and services. This community is the Christian Church or the City of God, how Augustine called it. Simply God's lifegiving presence makes people loving each other, a thing which the normal state could never deliver. Lonelyness is a kind of death. This death can only be overcome through God who is community, life, love and light in himself. Jesus is the life and the resurrection. It is only that many people have to undergo a very long process until they grasp the gospel of Jesus Christ, and become members of the Churchs, God's state, and especially for them the ordinary state is very important because the state preserves their lifes until they become faithful at last. Of course, if someone hesitates too much, he may have to face judgement by God. The ordinary society contains people which will once become believers, and the church contains also false believers. Therefore the state shoud be neutral. If a church would be prefered it could happen that especially the false believers of that church would use this to persue their evil plans. Furthermore nobody on earth can change the heart of a human being. The state must imply that God may change one's heart once but up to this time the individual has deserved love and righteousness, no matter if it is a Muslim, a Buddhist, a Hindu, or any other adherent of any false belief. What gets me is that Christians like Rainer here say stuff like this all the time, and then act all innocent when we point out just how offensive it is to nonChristians, and plenty of Christians, alike. Truly amazing! I only wanted to express that even somebody who favours Christianity can also favour a neutral state. It is almost desireable from the Christian stance that the state is neutral. Roman Catholic clergies have molested children for many years, and I believe that the authorities knew that but they did not intervene possibly because they hesitated to attack such an old, honerable church like the RCC. Elected officials shied away from investigating the child abuse because it wasn't politically wise to challenge the RCC back then. Too many Catholics would rather pretend that the abuse wasn't there than give ammunition to their protestant rivals. Hey RB ...............you smater than a 5t grader ? Once the Catholic Church persecuted the Calvinists of France, and later the Calvinists persecuted the Lutherans of Pruzzia (according to Frederic the Great). The issue is that even a Christian can commit crimes, and furthermore there are always people which call themselves Christians but they are not real Christians. A real Christian would never persecute somebody of another faith, that is always a crime which should be punished by the state. The only legitimate weapon of a true Christian is the telling of the true doctrine. Nobody can be forced to accept the doctrine of the Early Church which we find in the Bible. If someone doesn't understand how the US works politically, no matter how many words they use to post, it's moot. Separation of Chruch and State. Period. "People need something which makes them loving each other and having community independent from exchanging goods and services. This community is the Christian Church or the City of God, how Augustine called it." You appear to assume that people have never loved one another except in a Christian state. I recommend travel and a lot of reading to catch up with world realities. By the laws of the federal government (Consti-tution's Commerce Clause) , marijuana is an illegal drug. The citizens of Colorado and Washington State disagree and have made marijuana legal so one assumes that states still have a lot of power. Making Christianity the religion of NC is analogous to having a state bird or flower. Nice but so what? The states don't have the power to legalize marijuana, only to get away with it. Federal agents can still arrest you for illegal substances even if legal in the state. The commerce clause defines state's and federal roles for interstate and international commerce. SEATTLE, Wash. – If you think 2013 will be a half-baked year for tourism in Seattle, you haven't been paying attention to the curiously pungent smoke signals emanating from this city. On a recent chilly evening, an unmistakable smell has drifted across the street from an industrial space in the SODO neighborhood. Inside, a DJ spins an eclectic mix of rock while a man in a tie-dyed hoodie distributes cannabis-infused buttered rum and root beer-flavored hard candy to a diverse crowd of revelers. Another volunteer passes around a 12-foot-long "vape bag" filled with marijuana vapor - one way to get around the city's indoor smoking ban." The difference is that anyone who is not Christian can be forced to leave the state because they are not Christian. That include Jewish, Muslim, Wiccan, Druid, Sufi, Hindu, etc. When the colonies were first established here, each colony had its specific version of Christianity, and if you didn't worship that, you were not allowed to. The only colony that didn't do this was Rhode Island. they had freedom of religion. austin: you evaded my question about free will in the same evasive manner that gopher has. are you a coward, too? Sam, where was this question posted? it was posted saturday and i believe sunday. answer how an omniscient (knowing all that will ever happen) and free will are compatible. Also, if I might add, how a God who directly reveals himself to only a chosen few, such as himself, isn't interfering in free will? what a surprise, austin doesn't respond. free will is the ability of agents to make choices unconstrained by certain factors"
Is that was passes as an unambiguous definition for you? Swiss cheese. ".....put some factors are okay"
Their State is really a State of total Panic.